Kumbh Mela or Kumbha Mela (/ˌkʊm ˈmeɪlə/ or /ˌkʊm məˈlɑː/) is a mass Hindu pilgrimage of faith in which Hindus gather to bathe in a sacred or holy river. Traditionally, four fairs are widely recognized as the Kumbh Melas: the Haridwar Kumbh Mela, the Allahabad Kumbh Mela, the Nashik-Trimbakeshwar Simhastha, and Ujjain Simhastha. These four fairs are held periodically at one of the following places by rotation: Haridwar, Allahabad (Prayaga), Nashik district (Nashik and Trimbak), and Ujjain. The main festival site is located on the banks of a river: the Ganges (Ganga) at Haridwar; the confluence (Sangam) of the Ganges and the Yamuna and the invisible Sarasvati at Allahabad; the Godavari at Nashik; and the Shipra at Ujjain. Bathing in these rivers is thought to cleanse a person of all sins. The priests at other places have also claimed their local fairs to be Kumbh Melas. For example, the Mahamaham festival at Kumbakonam, held once in 12 years, is also portrayed as a Kumbh Mela. The exact age of the festival is uncertain. According to medieval Hindu mythology, Lord Vishnu dropped drops of Amrita (the drink of immortality) at four places, while transporting it in a kumbha (pot). These four places are identified as the present-day sites of the Kumbh Mela. The name "Kumbh Mela" literally means "kumbha fair". 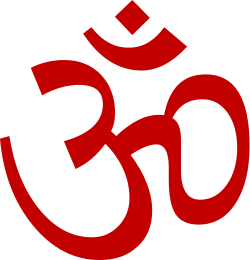 It is known as "Kumbh" in Hindi (due to schwa deletion); in Sanskrit and some other Indian languages, it is more often known by its original name "Kumbha". The festival is one of the largest peaceful gatherings in the world, and considered as the "world's largest congregation of religious pilgrims". There is no precise method of ascertaining the number of pilgrims, and the estimates of the number of pilgrims bathing on the most auspicious day may vary. An estimated 120 million people visited Maha Kumbh Mela in 2013 in Allahabad over a two-month period, including over 30 million on a single day, on 10 February 2013 (the day of Mauni Amavasya). While several ancient texts, including the various Puranas, mention the samdura manthan legend, none of them mentions spilling of the amrita at four places. Neither do these texts mention the Kumbh Mela. 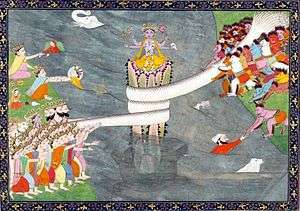 Therefore, multiple scholars, including R. B. Bhattacharya, D. P. Dubey and Kama Maclean believe that the samudra manthan legend has been applied to the Kumbh Mela relatively recently, in order to show scriptural authority for it. 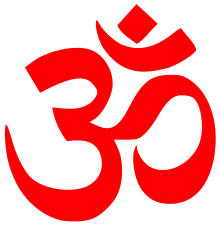 The Kumbh Mela of Haridwar appears to be the original Kumbh Mela, since it is held according to the astrological sign "Kumbha" (Aquarius), and because there are several references to a 12-year cycle for it. The earliest extant texts that contain the name "Kumbha Mela" are Khulasat-ut-Tawarikh (1695 CE) and Chahar Gulshan (1759 CE). Both these texts use the term "Kumbh Mela" to describe only Haridwar's fair, although they mention the similar fairs held in Allahabad and Nashik district. The Khulasat-ut-Tawarikh lists the following melas: an annual mela and a Kumbh Mela every 12 years at Haridwar; a mela held at Trimbak when Jupiter enters Leo (that is, once in 12 years); and an annual mela held at Prayag in Magh. The Magh Mela of Allahabad is probably the oldest among these, dating from the early centuries CE, and has been mentioned in several Puranas. However, its association with the Kumbha myth and the 12-year old cycle is relatively recent, probably dating back to the mid-19th century. D. P. Dubey notes that none of the ancient Hindu texts mention the Allahabad fair as a "Kumbh Mela". Kama Maclean states that even early British records do not mention the name "Kumbh Mela" or the 12-year cycle for the Allahabad's fair. The first British reference to the Kumbh Mela in Allahabad occurs only in an 1868 report, which mentions the need for increased pilgrimage and sanitation controls at the "Coomb fair" to be held in January 1870. According to Maclean, the Prayagwal Brahmin priests of Allahabad adapted their annual Magh Mela to Kumbh legend, in order to increase the importance of their tirtha. Besides their religious significance, historically the Kumbh Melas were also major commercial events. Baptist missionary John Chamberlain, who visited the 1824 Ardh Kumbh Mela at Haridwar, stated that a large number of visitors came there for trade. He noted that the fair was attended by "multitudes of every religious order", including a large number of Sikhs. According to an 1858 account of the Haridwar Kumbh Mela by the British civil servant Robert Montgomery Martin, the visitors at the fair included people from a number of races and religions. Besides priests, soldiers, and religious mendicants, the fair was attended by several merchants, including horse traders from Bukhara, Kabul, Turkistan, Arabia and Persia. Several Hindu rajas, Sikh rulers and Muslim Nawabs visited the fair. A few Christian missionaries also preached at the Mela. Traditionally, the fairs at the following four sites are recognized as Kumbh Melas: Prayag (Allahabad), Haridwar, Trimbak-Nashik and Ujjain. The Kumbh Mela in the Nashik district was originally held at Trimbak, but after a 1789 clash between Vaishnavites and Saivites over precedence of bathing, the Maratha Peshwa shifted the Vaishnavites' bathing place to Ramkund in Nashik city. The Shaivites continue to regard Trimbak as the proper location. Priests at other places have also attempted to boost the status of their tirtha by adapting the Kumbh legends. The places whose festivals have been claimed as "Kumbh Mela" include Varanasi, Vrindavan, Tirumakudal Narsipur, Kumbhakonam (Mahamaham) and Rajim (Rajim Kumbh). Even Tibet has hosted a festival claimed to be a Kumbh Mela. One of the major events of Kumbh Mela is the Peshwai Procession, which marks the arrival of the members of an akhara or sect of sadhus at the Kumbh Mela. The major event of the festival is ritual bathing at the banks of the river in whichever town Kumbh Mela being held:Ganga in Haridwar, Godavari in Nasik, Kshipra in Ujjain and Sangam (confluence of Ganga, Yamuna and mythical Saraswati) in Allahabad (Prayag). Nasik has registered maximum visitors to 75 million. Other activities include religious discussions, devotional singing, mass feeding of holy men and women and the poor, and religious assemblies where doctrines are debated and standardised. Kumbh Mela is the most sacred of all the pilgrimages. Thousands of holy men and women attend, and the auspiciousness of the festival is in part attributable to this. The sadhus are seen clad in saffron sheets with Vibhuti ashes dabbed on their skin as per the requirements of ancient traditions. 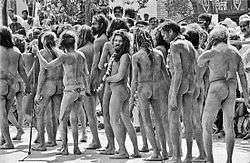 Some, called naga sanyasis, may not wear any clothes even in severe winter. The right to be naga, or naked, is considered a sign of separation from the material world. Kumbh Mela has been theme for many a documentaries, including Kings with Straw Mats (1998) directed by Ira Cohen, Kumbh Mela: The Greatest Show on Earth (2001) directed by Graham Day, Short Cut to Nirvana: Kumbh Mela (2004) directed by Nick Day and produced by "Maurizio Benazzo", Kumbh Mela: Songs of the River (2004) by Nadeem Uddin, Invocation, Kumbh Mela (2008), Kumbh Mela: Walking with the Nagas (2011), Amrit: Nectar of Immortality (2012) directed by Jonas Scheu and Philipp Eyer, Inside the Mahakumbh (2013) by the National Geographic Channel and Kumbh Mela 2013: living with Mahatiagi (2013) by the Ukrainian Religious Studies Project Ahamot. Indian and foreign news media have covered the Kumbh Mela regularly. On 18 April 2010, a popular American morning show CBS News Sunday Morning extensively covered Haridwar's Kumbh Mela, calling it "The Largest Pilgrimage on Earth". On 28 April 2010, BBC reported an audio and a video report on Kumbh Mela, titled "Kumbh Mela 'greatest show on earth." Young siblings getting separated at the Kumbh Mela were once a recurring theme in Hindi movies. Amrita Kumbher Sandhane, a 1982 Bengali feature film directed by Dilip Roy, also documents the Kumbh Mela. On 30 September 2010, the Kumbh Mela featured in the second episode of the Sky One TV series "An Idiot Abroad" with Karl Pilkington visiting the festival. 1 2 3 McLean, Kama. "Seeing, Being Seen, and Not Being Seen: Pilgrimage, Tourism, and Layers of Looking at the Kumbh Mela." (2009): 319-41. Ebscohost. Web. 28 Sept. 2014..
↑ "Kumbh Mela 2015-16: Nashik City" (PDF). Police Commissionerate, Nasik City. 2014. ↑ "Record 120 million take dip as Maha Kumbh fest ends". Khaleej Times. 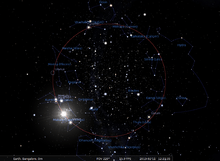 12 March 2013. ↑ "Photos: Kumbh Mela, world's biggest religious festival". CNN. 25 March 2013. 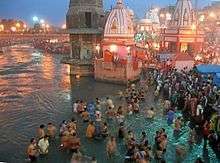 ↑ "Over 3 crore take holy dip in Sangam on Mauni Amavasya". IBNLive. 10 February 2013. 1 2 Rashid, Omar (11 February 2013). "Over three crore devotees take the dip at Sangam". The Hindu. Chennai. 1 2 3 4 Kama MacLean (August 2003). "Making the Colonial State Work for You: The Modern Beginnings of the Ancient Kumbh Mela in Allahabad". The Journal of Asian Studies. 62 (3): 873–905. doi:10.2307/3591863. JSTOR 3591863. 1 2 3 Vikram Doctor (2013-02-10). "Kumbh mela dates back to mid-19th century, shows research". Economic Times. 1 2 3 4 James G. Lochtefeld (2008). "The Kumbh Mela Festival Processions". In Knut A. Jacobsen. South Asian Religions on Display: Religious Processions in South Asia and in the Diaspora. Routledge. pp. 32–41. ↑ William R. Pinch (1996). "Soldier Monks and Militant Sadhus". In David Ludden. Contesting the Nation. University of Pennsylvania Press. pp. 141–156. ISBN 9780812215854. ↑ James Lochtefeld (2009). Gods Gateway: Identity and Meaning in a Hindu Pilgrimage Place. Oxford University Press. pp. 252–253. ISBN 9780199741588. ↑ R. Dasgupta. "Time Trends of Cholera in India : An Overview" (PDF). INFLIBNET. Retrieved 13 December 2015. ↑ "Maha Kumbh Mela (1954): 800 dead". rediff.com. 4 March 2010. 1 2 J. C. Rodda; Lucio Ubertini; Symposium on the Basis of Civilization--Water Science? (2004). The Basis of Civilization--water Science?. International Association of Hydrological Science. pp. 165–. ISBN 978-1-901502-57-2. ↑ Vaishali Balajiwale (13 July 2015). "Project Trimbak, not Nashik, as the place for Kumbh: Shaiva akhadas". DNA. ↑ "Kumbh Mela concludes at T. Narsipur". The Hindu. 7 February 2004. 1 2 Mela Adhikari Kumbh Mela 2013. "Official Website of Kumbh Mela 2013 Allahabad Uttar Pradesh India". Retrieved 24 November 2015. ↑ "India's Hindu Kumbh Mela festival begins in Allahabad". BBC News. ↑ "Ardha Kumbh – 2007: The Ganges River". Mela Administration. Retrieved 2012-01-05. ↑ Kumbh Mela: the largest pilgrimage – Pictures: Kumbh Mela by Karoki Lewis The Times, 22 March 2008. Behind paywall. ↑ "Short Cut to Nirvana - A Documentary about the Kumbh Mela Spiritual Festival". Mela Films. ↑ "Amrit:Nectar of Immortality". Retrieved 24 November 2015. ↑ "Why twins no longer get separated at Kumbh Mela". rediff.com. 15 January 2010. Maclean, Kama (28 August 2008). Pilgrimage and Power: The Kumbh Mela in Allahabad, 1765-1954. OUP USA. ISBN 978-0-19-533894-2.